4 years old. Exposed to Maximillian. 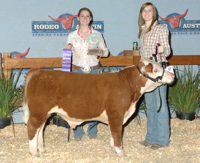 2008 HLSR Grand Champion cow. 11 year old cow. Bred to Herbie. 2001 NWSS Reserve Grand Champion Female. 2 years old. Bred to Maximillian for a summer calf. Exposed to Maximillian. Proven donor cow. 7 years old. Champion in her show career, Dam to numerous champions. Thank you for visiting our website. 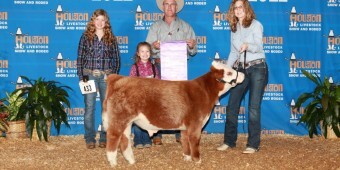 We are breeders of Polled and Horned Miniature Hereford cattle in Amarillo, Texas. Our little Herefords have proven their ability to thrive in this environment, despite the climate. We moved our operation here in 2011 from Southeast Texas. Our Miniature Herefords have the genetic strength to thrive in one of harshest climates for livestock in North America. Our cattle are bred for hardiness, productivity, efficiency, and carcass quality. 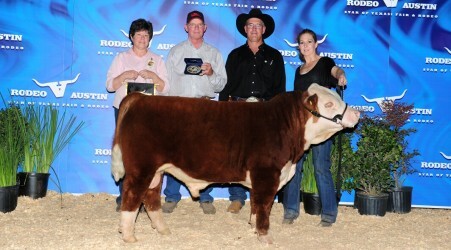 Our cattle are bred to thrive in real world environments as well as the ability to perform in the show ring. We can help you find your Miniature Herefords, whether you’re looking for a pet for the back yard, a show animal, or a beef project. 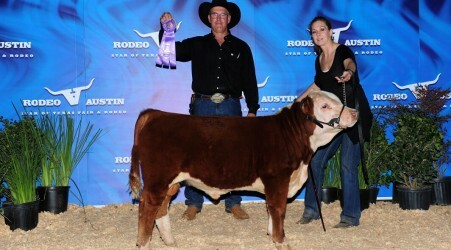 Come see us, we’ll be glad to work with you in your search for Miniature Herefords. Please browse our site, and thanks for visiting! Miniature Herefords are an animal for the backyard beef industry. One man can hang a quarter and process it himself. The average Miniature Hereford carcass provides a smaller amount of beef that a family of four can consume within the recommended freezer shelf life. For people who have moved from the city to small farms, the little Herefords are ideal. They may be considered pets, enjoyed as a hobby, treated as a secondary source of income, or employed as a full time business. Since their smaller frame makes them more suitable to the average family, they may be used for personal backyard beef or sold as locker beef in a farmers market. They are used to classify small acreage for agricultural exemption status and are appropriate for group investment ventures or tax shelters. Minis are naturally docile and make excellent show animals for any level of competition. Two or three may be kept in place of one standard size cow. Each miniature mother will wean a calf weighing a higher percentage of her mature weight, thus making them much more economical. They are also practical for stocking larger operations and can help in the movement that is presently underway to return to a more muscular, chunky type of animal that is able to thrive without pampering. An animal that is more efficient to maintain. Miniature Herefords now exhibit an improved cow/calf weaning ratio, greater rib eye are per hundred weight, a higher dressing percentage and increased tenderness due to shorter muscle cell structure, genetics and early maturity. These traits are outstanding when compared to the modern beef animal.